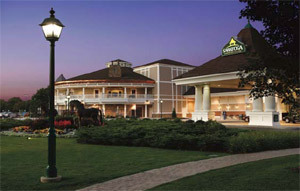 Located in the scenic and historic town of Saratoga Springs, New York, the Saratoga Gaming & Raceway facility is an entertainment destination for the Northeast. Features include over 1,700 video gaming machines, live harness racing, several restaurants and a recently opened nightclub. To automatically record all fire watch and building checks and to help ensure the security of the environment for guests and employees through an automated key management system. The Saratoga Gaming & Raceway facility, known as a “racino” (combined racetrack and video gaming casino), employs a staff of more than 600 and is served by an in-house security team that protects the entire 156 acre property. Security and surveillance on the 50 plus buildings is continuous, per the rules and regulations established by the New York State Racing and Wagering Board. Adhering to mandated procedures such as the daily checks of multiple buildings can become routine and potentially careless unless there is a method in place to ensure the tasks are being completed. In addition, because casinos store and use large amounts of cash, access to keys needs to be strictly enforced and requires a safe and secure key management system. PowerCheck® Guard Tour System – with its multiple tour capabilities, integrated functions and reporting options, the PowerCheck Guard Tour System delivers a convenient and cost-effective solution to the Saratoga Gaming & Raceway facility. Tour Pro® Software – the Tour-Pro Data Sorting Software is a Windows® application which converts the tour information into printable reports which may be customized by time, day, week and month. For added value and convenience, this same software can be used to program the data recorder and manage the files. KeyWatcher® Key Control System – by only releasing assigned keys to users with the proper authorization code, the KeyWatcher system helps guard against stolen or misplaced keys. Simple and elegant in design, the wall-mounted key storage cabinet eliminates outdated lock boxes, unreliable manual logs and messy key identification tags. KeyWatcher records the access history of each key, including user, date and time of checkout/ return. With the PowerCheck Guard Tour System, the security department of the Saratoga Gaming & Raceway facility can automatically record when building checks are made. On their rounds, the officers simply hold the data recorder up to a station to record the visit. This procedure ensures that the security department maintains a constant vigil on the properties. This information can be downloaded by the supervisor to ensure that the station reads on these tours are being completed in a timely manner and that the areas where the stations are located were physically checked. The KeyWatcher Key Control System installed in the Gaming facility is where all of the sensitive keys are stored. This rugged steel cabinet with illuminated key slots is designed to resist abuse, is wired to alarm against tampering and can be easily programmed to allow access to only those who have clearance. Keys are tracked while in use, including times and user names, and should the key not be returned or returned late, management is notified and can take the appropriate action. Recording, managing and retrieving the access and guard tour data is an uncomplicated procedure and reports are quickly generated as required. 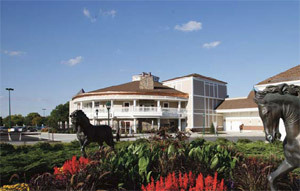 According to security management at the Saratoga Raceway & Gaming facility, in its ten years of use at the facility, the PowerCheck Guard Tour System has definitely delivered an overall contribution to the protection of the property. Security officers are better able to perform their duties while make their rounds. In addition, management can better monitor the security officer’s performance and follow up with additional training when required. The KeyWatcher system has elevated key management to a more sophisticated and intelligent level, in keeping with the security policies and procedures established by the racino. Only a few authorized individuals have access to the sensitive keys and should they not be returned on time, management is immediately notified. In an environment where cash is a daily temptation, the KeyWatcher system helps to reduce the risk.